Found these two at a local used bookstore today. The Metaphysical Club won the Pulitzer Prize the year it was released. Menand is also an accomplished essayist. I’ve always been fascinated by pragmatism since reading William James’s work. Metaphysical Club elaborates elegantly on the origins of this American philosophy. I studied management and leadership at undergraduate (and graduate) school and one of the books I reviewed as part of a course was T. E. Lawrence’s 7 Pillars of Wisdom. That was a very interesting book. 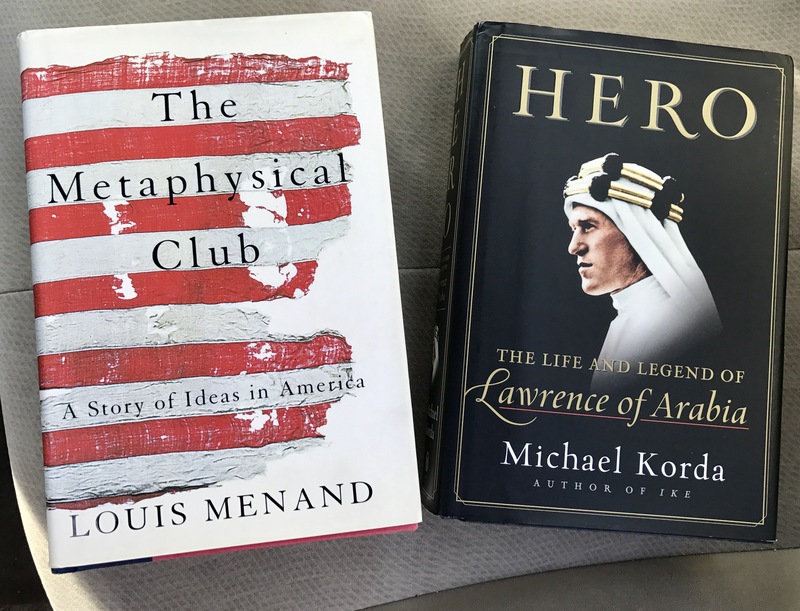 I remember thinking I needed to find a good biography on Lawrence. So finally, many years later, I’ve finally picked one up for cheap. Great finds! Have you begun the Metaphysical Club? I’ve seen this book many times but never purchased it. I have a few like it but I am more interested now that you pointed it out. I have several books on practical leadership, a collection of many historical figures from Alexander, Hannibal, Augustus, Martel, Yusuf ibn Tashfin, Napoleon all the way to Lee and Grant, and several American presidents. I actually started reading the Metaphysical Club years ago when it first came out. I liked it, but got sidetracked—as I do often—and lost the book somewhere along the way. So when I saw this copy for $5 dollars I said, “Well, I need eventually read this again.” I really like William James and pragmatism, so I’m drawn to its history. A truly American philosophy, it saved me philosophically (an spiritually for that matter) many years ago when I was trying to reconcile competing perspectives. I think I would describe my collection of bios as mostly containing sketches of people renown for military leadership, statesmanship, and the Arts. Now, the bigger question might be, while I’ve read many of the bios on my shelves, will I ever get around to reading ALL of them?…that’s a tall order since my “To Read” pile keeps growing. Along with that I want to somehow keep blogging (obviously that’s not consuming my time) and writing other stuff. Wow, time management books are really what I need! Reminds me of that quote: Art is long and life is short.